Safely remove BAG-IC, keep pins intact. Much more safe and reliable. Blowing PCB will not make it blister. The air flow can be adjustable, and air blowing is big and gentle blowing plastic components won't be deformed. Such as buzzer and external interface of mobile phone. 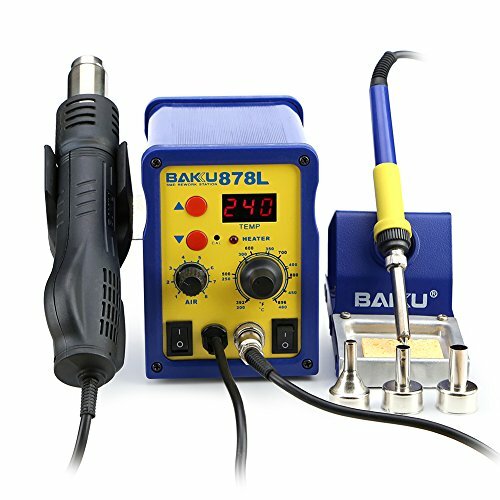 Hot air and hot iron 2 in 1 high performance rework soldering iron station. You can use hot air gun and soldering iron separately, with no interference with each other. The products adopt closed loop of transducer. Mcu intelligent drive, LED digital display, high-power. The temperature turn up is very fast. Temperature stabilization and be impervious to air. Use the brushless, long life and low noise. Alloy metal body with high-quality environment silicone shell features elegant appearance and power saving. It is inductance in the handle, it will be quickly to work when you take the handle automati; When the handle is return to the shelf, the machine will automatic stopage. Automatic to blow cool air to safe the heating, temperature rapidly rises, and it can reach to the seeting temperature only within 3 or 5 seconds. Small volume light weight, temp-control accurately. Use DHL shipping services, only need 5-7 days. If you have any questions about this product by Baku, contact us by completing and submitting the form below. If you are looking for a specif part number, please include it with your message.